Wheat is nearing heading in much of the area and is flowering farther south. Because the flag leaf and one below contribute over 80% of the yield for wheat, producers have been asking if a fungicide is needed this year. We haven’t had disease pressure regarding rust or powdery mildew so far, so I’ve been recommending to wait till closer to heading and see what weather conditions are like. If you are considering foliar fungicide products such as Headline, Quilt and Stratego for example, these cannot be applied once the head begins to flower according to the labels. favored by humid, moist conditions for about a 2 week period around and during flowering. If scab is a concern for you, you will want to continue monitoring the situation and apply products like Caramba and Prosaro when the plants are early in their flowering stage. We used to say aim for fungicide application between 15-50% flowering. Instead, I would say aim for that application shortly after your heads fully emerge or as early flowering as possible. My reasoning for this is that so often wheat begins to pollinate shortly after full head emergence and by the time airplanes get to your fields, your wheat may be too far along for the fungicide to work as effectively as it should. 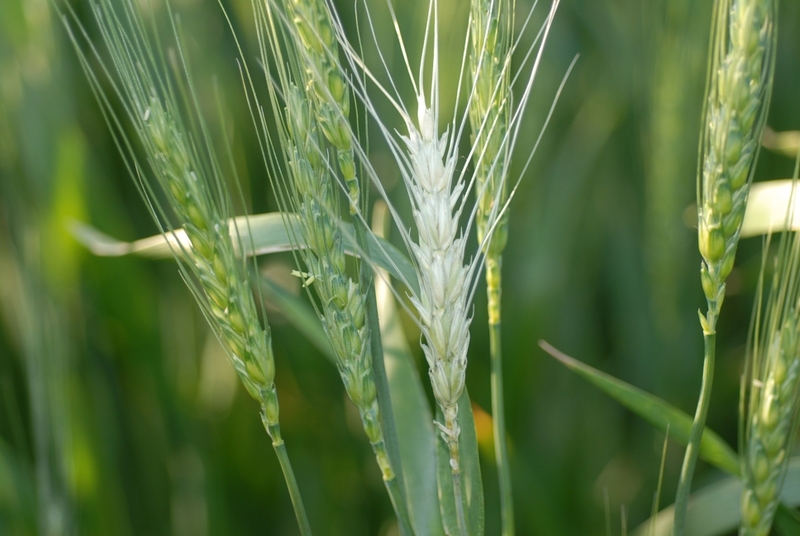 Remember, the wheat head will begin to flower in the center of the head first. The fungicide product also needs to be on at least 4 hours before a rain event. This is very tricky to time fungicide applications for scab as you’re typically applying them because it’s raining or rain is in the forecast. These products are curative products that are locally systemic, so they will also provide at least a 2 week residual and kill fungi causing leaf and stripe rust, tan spot, septoria leaf blotch, and powdery mildew. That’s why I was suggesting to consider waiting on foliar fungicide applications this year to potentially save money by making one application during heading with as little disease pressure as we have seen. Both Caramba and Prosaro have a 30 day pre-harvest interval, so that’s another thing to keep in mind. Products, rates, and further information can be found starting on page 219 of the 2011 UNL Guide for Weed, Disease, and Insect Management. Dr. Stephen Wegulo, UNL Extension Wheat Pathologist, writes articles for Crop Watch at http://cropwatch.unl.edu nearly every week, so you can keep up with wheat diseases and fungicide information by checking that out. You can also sign up to receive scab alerts at the following Web address: http://scabusa.org/fhb_alert.php. Posted on May 25, 2011, in Crop Updates and tagged Agriculture, Crops, Diseases. Bookmark the permalink. 2 Comments. Dr. Stephen Wegulo, UNL Extension Wheat Pathologist, just released the following regarding the Scab Risk Assessment for Nebraska: Today, May 25, 2011, the National Fusarium Head Blight Risk Assessment Tool is showing that the risk of scab is elevated from low to moderate in southeast, south central, southwest, and north central Nebraska. This follows a significant amount of rainfall during the second half of last week and the first half of this week. The risk level is likely to rise over the next 10 days. It is recommended that a fungicide be applied at early flowering to suppress scab. The fungicides Prosaro and Caramba are good in suppressing scab and very good to excellent in controlling foliar diseases. If foliar disease pressure is low and the flag and flag -1 leaves are free of disease, delay a fungicide application until early flowering and then apply a fungicide that will both suppress scab and provide protection against foliar diseases.